Everything is ice. You just want to get to the refuge, but the land is tough and the Frost is coming. In Frost, you are looking to make it through 40 days on foot — hoping to make it with your fellow survivors to the refuge ahead. To make this journey, you must travel forward and take on whatever challenges wait by playing resource cards. At the start of each turn, you are given a hand of cards to work from. Depending on the cards that you have unlocked there is a variety that you can start with. Some of these cards are survivors, used to forage for more goods, others are fruits or wood. Some are black, fatigue cards that require rest to defeat. Once you have looked at your hand, you can address the cards in front of you. One of the cards is the type of biome you need to take on. The various biomes within Frost each require different resources to pass. These biomes can ask for any number of people, fruits, and wood. You’ll need to sacrifice the cards in your hand to it in the hopes of completing its needs and moving forward as fast as possible. If you don’t have a resource, but have a human, you can send them out to forage in the hope that they pick up the item you need. Foraging, like most things in Frost, is dangerous. You might end up with a fatigued human, a super fatigued human, or a dead human — removing that card completely from your hand. Super fatigued cards, like fatigued cards, can be solved by resting, however, if you end up with 3 in your hand, the game automatically ends, so it’s good to keep an eye on them! If you don’t have any cards to play then you can then end your turn, forcing the storm closer to you but refreshing your hand. There are a few other cards in your field of vision that you may also need to deal with or may want to use. The level that you are against comes with an action card — some of these cards are dangers, like wolves, that can be defeated to prevent loss of health or humans once you move forward. Others, like priests, can give you health in exchange for items. There is a big variety of action cards, so you won’t always get the chance to run into the same cards during an adventure. Some even have a percentage chance of trading one of your resources for another. At the very top of your screen you will see idea cards. Idea cards are quite special in that they are exchanged for your items and added to your deck. These have a wide variety of abilities, from becoming weapons you can play against dangers to items that you can use for a chance of gaining more resources or getting rid of fatigue. If you do move forward when you have a dangerous action card ahead of you, you will need to make a very important decision. If there is a survivor in your hand, you can sacrifice them, otherwise you will need to take a point off of your health. If your health reaches zero then the game ends. As you move forward a danger counter at the top left of the screen continues ticking up or down, all depending on how fast you move through the biome. This indicates how far away the storm is, and once again, if you end up in the storm you will die. With so many different ways to die, you will end up relying on a little bit of luck, and a lot of thought into your cards, to make it through the full 40 days. In Frost, there are a bunch of different modes, but the Classic way of playing allows you to see what your current deck is, via an indicator under your player’s face. This is very helpful when it comes to making decisions on foraging at the expense of your survivors or just trying for a new hand by taking another turn. Once you get the hang of Classic mode, you start to unlock different stories that change the game. The first being Father, where you’re starting deck contains three survivors, none of which are allowed to die. The Father also has various abilities like sacrificing their life to allow a player to remove fatigue and trading resources for a chance at a human who doesn’t need to survive. This mode also doesn’t show you your card count during the game, which adds more to the challenge of this specific mode. You can also take the time to customise your starting deck and set out on an adventure like that — Frost does give you a bunch of options. Whether you die or succeed, you will most likely unlock new cards, that can then be seen in your very next run. 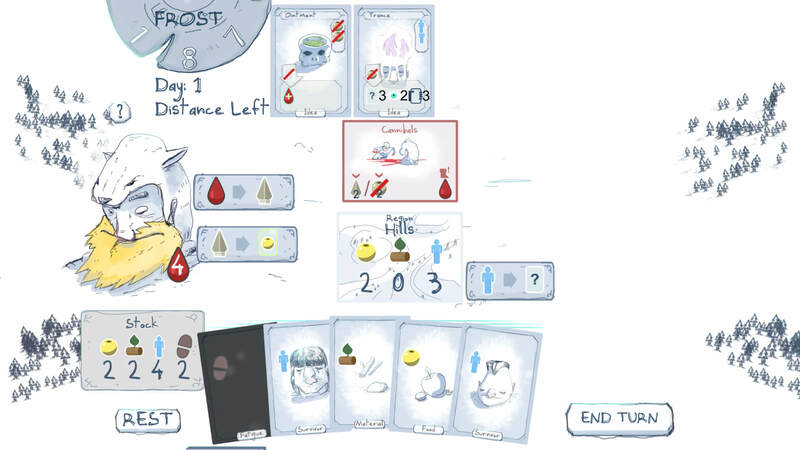 With quick rounds, nice hand drawn art, and sound effects that haunt you, Frost is a really polished, well made game. I am personally not a fan of deck builders, however, Frost doesn’t rely on you building the best deck possible to survive. Instead, you can just work with what you have and hope that your next hand will contain exactly what you need. Unlocking the different story modes, which do come with a bit of story, is a lovely way to add more gameplay, as you do want to take on that challenge. More often than not, I did die, but I really enjoyed my adventures each time. 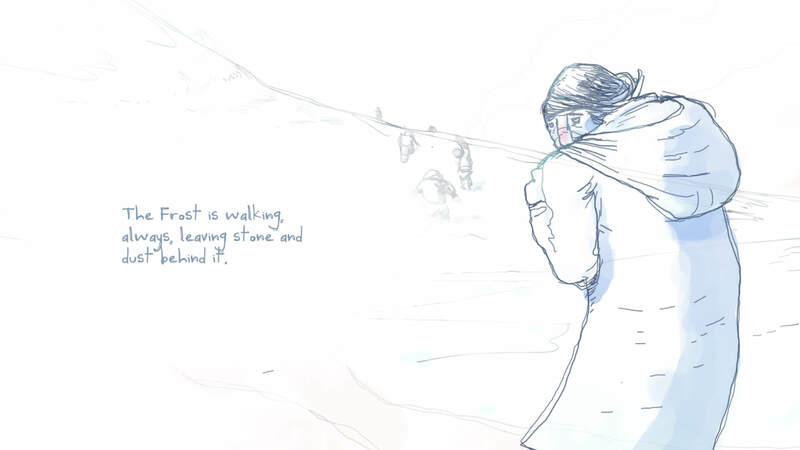 You can play Frost on PC, Android and Xbox One.